¶ My Most Excellent Year is a novel of love, Mary Poppins & Fenway Park by Steve Kluger. 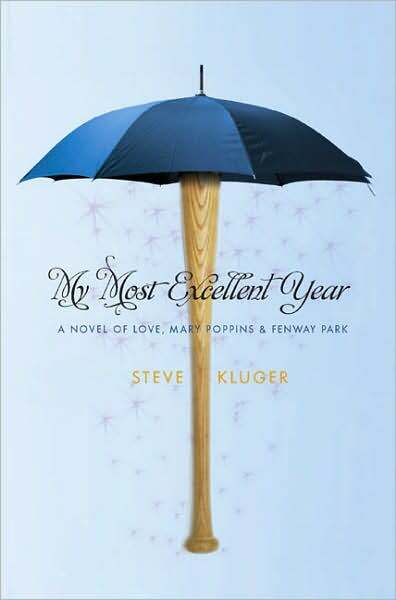 My Most Excellent Year is a novel about three high schoolers stumbling their way through relationships, family, school, and working their way toward whoever they’re bound to become. Being teenagers, essentially. TC is from Boston, lives baseball, loves Alé, is Augie’s best friend. Augie is gay, is Chinese, breathes theatre, knows how to keep everything around him on track. Alé is the daughter of a former diplomat, is new, is smart, has a secret passion for performance. They’re in search of their happiness, and discover it in pursuing making happiness happen for others. Kluger has fun with form. The book embraces the Victorian idea of narrative collage through diaries and letters and re-molds it for the present: diaries and letters still, but also e-mails, blogs, IMs. It’s all about family. Not just the bonds of the families we’re born into. Those are explored: Alé’s small rebellions allow her to bond with a brother she’d found distant. But more central are the families the characters create for themselves. TC’s mom died when he was a child and shortly after he met Augie. The boys decided that more than best friends, they would be brothers. They dragged their families into their plan and now Mom, Dad, and Pop are learning to co-parent their shared teenage sons. TC meets Hucky, a young lonely deaf boy abandoned by his mother and living in a home for deaf children. Just as August rescued TC in his loneliness, TC decides to become Hucky’s family, heaping on him the attention, love, and hope that the child has been missing. TC, Augie, and Alé’s strength and boundless empathy are a direct product of the support they find in their families, natural and self-made. It is part of an exciting trend in YA novels with gay characters. Augie comes out early in the story and it’s fairly unremarkable. It’s what follows that’s tough: negotiating a relationship, dealing with school and family, figuring out what he wants to do in life – exactly the same challenges as TC and Alé face. Auguie’s gayness is an important attribute, certainly, but much in the way his Chinese background is: it informs him without defining him. He’s allowed to be a well-rounded character who exists beyond a single attribute. He’s a diva onstage, but he’s also a pretty good soccer player, a great friend, and an excellent brother. He’s a gay character, but character gets to be the leading idea. My Most Excellent Year is welcoming in its esoterica. Kluger can toss off Red Sox trivia as easily as he can throw in an subtle nod to Look Ma, I’m Dancin’. When it spans so many fields, the minute detail becomes avoids the trap of the closed-off obsessive and instead it reflects a loving devotion, whether to Kennedys, or the Red Sox, or musicals. My Most Excellent Year is completely unbelievable. The kids are just too successful in their schemes. Everything is working out just a little too well. Realistically, TC would be unlikely to garner national media coverage through a website campaign to rescue the reputation of a baseball player falsely sullied by the Chicago Black Sox. Realistically, TC and Allé would never simultaneously jump-start Congressional action to observe the history of Japanese-American internment camps. But throwing realistically out the window is the novel’s greatest strength. Instead of undermining the story’s plausibility, it reminds us of the boundless confidence that is the key to teenage dreams – the knowledge deep down that if only you could just get your chance, of course it will all work. Because we can believe that TC, Alé, and Augie can do all that, we can keep hoping Hucky’s dream will come true, too, and Mary Poppins will fly in on the wind one day and save him.